Chelsea 1-2 Crystal Palace: Defensive frailties blow the title race wide open. 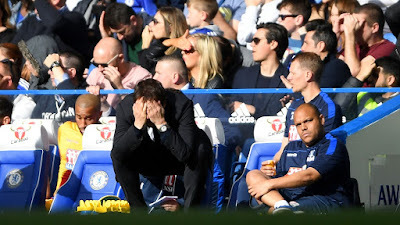 Chelsea suffered only their fourth defeat of the season on Saturday against Crystal Palace as defensive frailties came to the fore once again and blew the title race wide open. Chelsea has been flying lately with defeat to Tottenham the only blot on our copybook since Antonio Conte changed tactical formation. Concerns were raised in the immediate aftermath that day but we managed to re-group, take stock and go again so it will be interesting to see the reaction we have from everyone on Wednesday night against Manchester City in a game that has quite simply become the biggest of our season so far. Chelsea going forward did everything right apart from strike those killer blows to score and I am certain that on any other day would have scored two, three or even four. However, Sam Allardyce had once again set his team up defensively solid (with more than a little help from Wayne Hennesey in goal) and claimed his fourth victory against Chelsea with four different sides. You have to give Palace credit for the way they defended giving everything to stop us. At times such as these, with the run in to the title we have to be critical as it’s important to highlight the issues we had on the day to eradicate them and Antonio Conte with his technical staff would have spent hours evaluating the mistakes at the back over the remainder of the weekend. How Zaha was given the opportunity to score with four players around him is a concern. He was allowed the opportunity to control the ball, move ten foot across the edge of our area unchallenged, to then strike the ball low into the corner giving Courtois no chance in goal. The fact that Pedro gave the ball away deep in our own half to give Palace the opportunity is also worth noting as I believe that Victor Moses in that position would have blasted the ball down the line and away from danger. The Benteke goal was a complete disaster from start to finish as Chelsea were given a dose of their own medicine, giving the ball away having pushed too many men forward and hit on the counter attack. Chelsea were left exposed as Benteke and Zaha surged forward. As Chelsea’s defence tried to get back into position David Luiz made a shocking attempt to tackle the big Belgian striker and failed. Benteke twenty-five yards out plays a one-two with Zaha and lifts the ball over Courtois who, for one reason or another, is already on his arse as Palace hit Chelsea twice in five minutes to turn the match on its head. People talk of the first game after the international break being difficult because you have the majority of the players travelling backwards and forwards from different parts of the world. To this point it has not affected us this season but Saturday was different. The Manager seemed to be subdued and not as passionate as we are used to him being on the touchline. Eden Hazard drifted out of the game in the second half after his outstanding performance in the first half, whether that’s due to the fact that he has missed two weeks of football due to injury is up for debate but it was disappointing to see. I sincerely hope that we ALL take the game as a wake-up call, a time to re-group and to go again starting on Wednesday against Pep Guardiola’s Manchester City. We cannot afford to lose the game and give Tottenham the chance to close the gap to four points ahead our trip to Bournemouth on Saturday evening. There is plenty of work to be done at Cobham, the title race is far over!